Sanity, Interrupted...: I Eat My Peeps Head First. I'm going to go ahead and do the obvious for this week's Focus52 word: YELLOW which, to me, equals SPRING, which then equals, of course, the reemergence of Peeps into our lives! Seasonal candy is awesome in every which way. Not only does it remind you of the upcoming celebration to be had but rewards you with sweets that you haven't seen in a year. It's like meeting up with an old friend, giving them a hug and biting their chewy, sugary yellow head right off. Well, at least that's what it feels like when I see my old friend, Peeps. 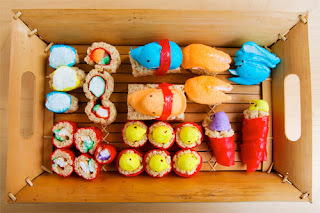 The simplest of candies; a marshmallow shaped like a chick (or a bunny), covered in colored sugar (yellow is best) is irresistible as it stares at you lovingly from the candy aisle, begging you to pick up a pack or two and eat them. They satisfy a rare feeling that no one really acts on (hopefully), the feeling of seeing something 'so cute you wanna eat em.' It's a feeling you get for babies and puppies that can't be expressed literally unless you want to go to the jail or the psych ward. However, with a Peep, quite possibly one of the cutest candies that was ever made (second only the comically shaped, alarmingly orange, Circus Peanut) - no one would look twice if one minute you were smiling sweetly at a Peep, overwhelmed by its adorableness, and the next minute you've decapitated said Peep, munching on its delicious head. They would do it themselves if they were lucky enough to have a pack. 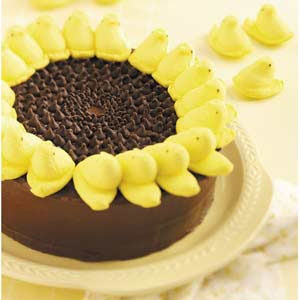 Because what else can you do with a Peep but eat it right up? 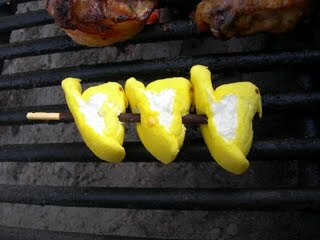 Well, thanks to the magic of the internet, I found that you can do a lot with a Peep! 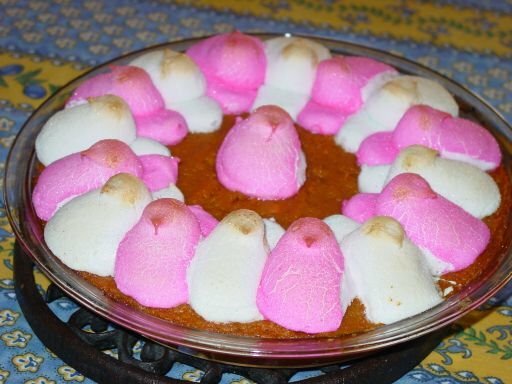 Peep pie looks pretty good but I have to vote for Cadbury Eggs over Peeps. Especially since they have the mini ones now. Mmmm. Okay, first off, I WANT that sunflower cake. dammit. This is exactly the kind of thing I forgot I was missing and you just reminded me.